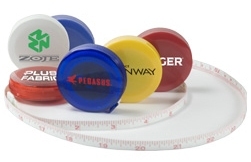 An outstanding mini tape measure with attractive styling and soft beveled edges. Hand cheap small and economical tape measure. * Measures up to 60 inches. pocket. A gift cheap in price but desirable. Poly Bagging of this item is included at no charge. improvement on other versions previously designed. early 1940s, when it slowly began to supplant a common folding wooden design of carpenter's ruler. Give this as a gift to reward loyalty of customers and employees.